At least 16 people died during protest marches on Nicaragua's Mother's Day in several cities across the country hours after business leaders called for new elections. Organizers planned the marches, called "Mothers of April," to protest the more than 70 people allegedly killed by police and pro-government gangs during protests in April against President Daniel Ortega's plan to raise social security taxes and cut benefits, human rights advocates said. That plan was shelved, but the protests grew into a movement against state violence and Ortega himself. Wednesday's marches were a continuation of these protests -- but resulted in more deaths as demonstrators came under attack by armed gunmen. The Nicaraguan Center for Human Rights -- also identified as CENIDH using its Spanish acronym -- which confirmed the death toll, accused the Nicaraguan government of attacking protesters in a statement Thursday. "CENIDH strongly condemns the acts of violence and repression by the government of Daniel Ortega," the group said. "We can categorically affirm, for having participated in this march and following up on these criminal actions, that the aggressors were the repressive police and shock forces under the command of Daniel Ortega and his wife, [Nicaraguan Vice President] Rosario Murillo." CENIDH counted eight deaths in Managua, including a 15-year-old boy and a man who was shot in front of his mother. Four more people were killed in Estelí and one killed in Masaya, the human rights group said. El Nuevo Diario reported that the son of a police officer was killed by police during the Managua protest. Francisco Reyes Zapata, 34, was shot in the head while participating in the march. The bullet is believed to have come from a police officer's AK-47, the victim's brother told the paper. 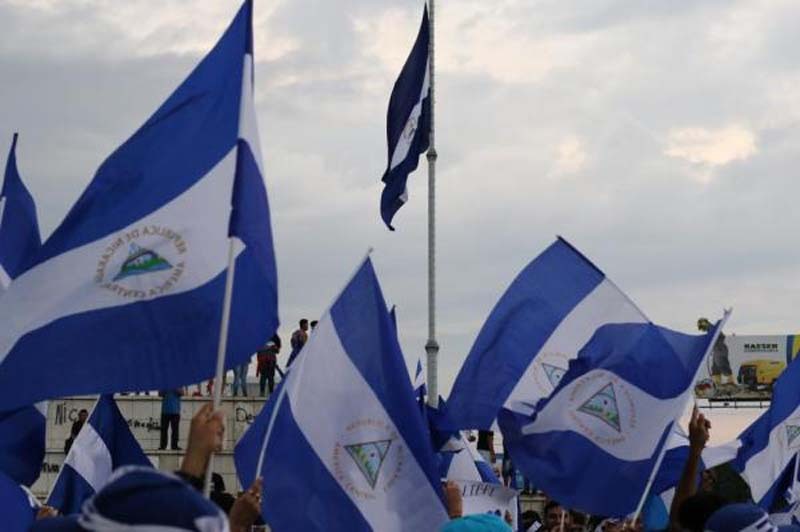 Two of the victims killed in Managua were members of the Sandinista Youth, a pro-government organization that demonstrators have blamed for carrying out attacks against them in recent weeks. Pro-government media blamed "right-wing delinquents" for the deaths. After the bulk of the violence Wednesday, a group of anti-government demonstrators retaliated by vandalizing the Dennis Martinez Stadium, the country's new multi-million dollar baseball venue. Around this area, streets were blocked off by demonstrators and sounds of mortar fire and gunshots rang out through the night. The protest violence on Wednesday came after a day in which Nicaragua's private business leaders announced their strongest disavowal of Ortega -- after years in which the private business sector has been accused of coddling the self-described socialist leader -- by calling for new elections. That morning, Nicaragua's richest man, Carlos Pellas, best known for his Flor de Caña rum brand, said in an interview with La Prensa that the country was "exhausted" and needed new elections. He added that Ortega has an "enormous responsibility" to both facilitate and accept changes to make the government more inclusive and democratic. Hours later, the Superior Counsel of Private Enterprise echoed Pellas' words and issued a statement that said the country's Supreme Court members must be replaced and new elections held. After those statements were published and just before violence struck in several Mothers of April marches, Ortega appeared at a pro-government rally in Managua to give a speech to his supporters. "Nicaragua is not the private property of anyone," he said. "Nicaragua's owners are all Nicaraguans regardless of political thought, religious thought, ideological thought."